The Free Doc Reader is a simple software program that allows the users to open any variety of documents easily and free of charge. Users can also open and view image files, resource files and HTML files. The Free Doc Reader tool enables users to open and view files, search documents, extract and copy text. It also allows the users to utilize basic features such as zoom and search. This free software program is a light weight program suited for easy access to files without the need to pay for it. 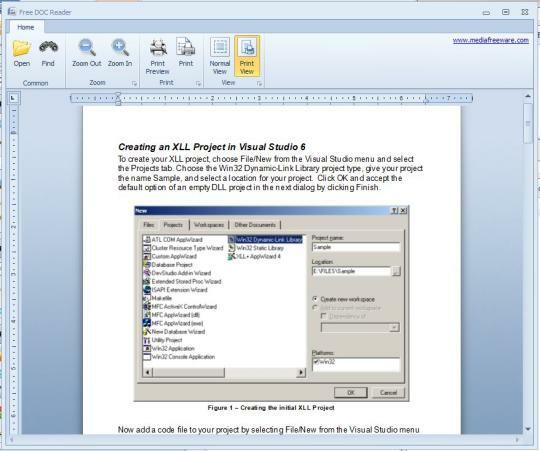 The program helps the users to open web pages and spread sheets along with the text documents. It is compatible with various formats such as HTML, XML, PDF, DOCX, XLS, TXT, RTF and many more. Users can also view various standalone files easily and quickly with the use of the Free Doc Reader tool. This free software program is rather easy to use and comprehend as it includes few options and tools which can be utilized accordingly. This handy program also includes a simple user interface. It has a search pane and an index pane which displays the files clearly. The Free Doc Reader is a simple application which allows easy access to various types of files within a few minutes. This program is quick and showcases perfect performance. This free software program is absolutely functional with the addition of new features constantly. The Free Doc Reader software is a simple and light weight program with easy accessibility. Although the Free Doc Reader has a few simple features, it is apt for its purpose as it allows the users to open and view files easily and freely. This software tool enables users to view the files without the need to pay and install various other software programs to view simple files.